My 11 days and 237 miles through the Welsh hills in almost incessantly wet weather and boggy ground conditions have convinced me more than ever that Trail Shoes are just not suited to prolonged treks where the ground could be consistently wet and boggy for days on end. At least not for me. A visit to the GP when I returned home revealed a rather bad foot infection which had spread to at least four toes, and progressing to the rest of my feet leaving them extremely tender and sore. My feet became very swollen after I’d stopped walking. I’m now on a course of antibiotics to clear the infection, which the GP said was almost certainly down to feet being wet for prolonged periods day after day, and sloshing through standing water which, lets face it, could contain quite a lot which could cause infection. Especially in grazing areas. My wife has taken to calling me ‘Taffy’ Evans when she looks at my feet currently, and did tell me a rather sobering story of a man who was brought into the hospital she works at last week with a toe infection. He’d let it go rather than seeking treatment and the result was that his leg had to be amputated below the knee to save the rest of his leg. Had I continued on the Cambrian Way it would have been almost another week until I’d seen a GP…a sobering thought. 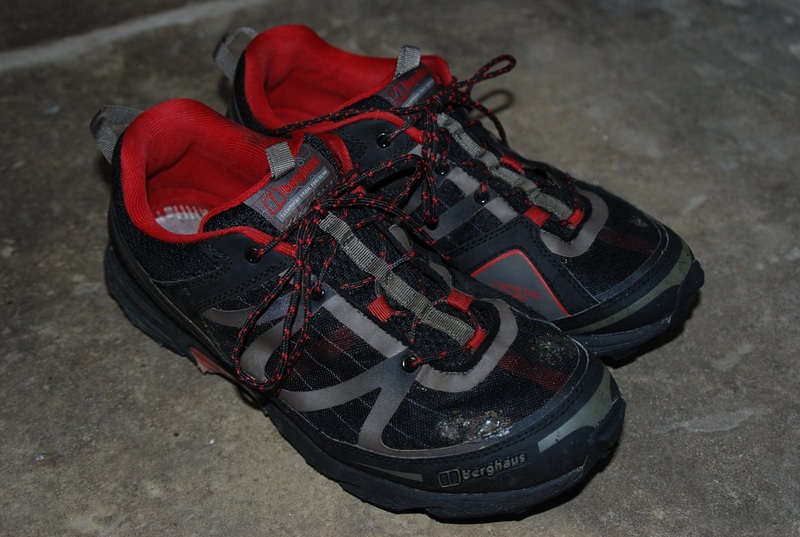 The Trail Shoes I used were Berghaus Vapour Claw, well fitting, broad across the toe box which is perfect for my feet, and supremely comfortable on the occasions I’ve worn them for a couple of days at a time. I used the same socks I wear with boots, and didn’t use waterproof socks or ones with a Gore-Tex membrane. However after about four days of my feet being consistently wet from sloshing through wet boggy ground, my toes particularly began to be quite sore and inflamed in places. The daily routine involved stopping to rest several times a day, removing my shoes, wringing out the socks, and leaving my feet to air for a while. It was however almost impossible to get feet dry at all during the day for a period of 10 days of the trek. I also noticed that when the Trail Shoes were wringing wet, that my feet had a tendency to slip to the front of the shoes when descending, crushing my toes sometimes. Without ankle support it’s more difficult to prevent this, and simply lacing the shoes more tightly caused other issues by narrowing the broad fit of the toe box. Perhaps a more rigid trail shoe would have suffered less in this regard, but the real damage was done from the continual wetness causing softening of the skin and eventually providing a route for infection**. One last observation is that after only 100 miles the Vapour Claw’s showed surprising signs of wear, with holes appearing in the mesh of the toe box. I purchased some fast setting epoxy resin at Llandovery to repair another item of kit, and over the remainder of the trek I made first aid repairs to the mesh in at least five places to stop the shoes falling apart before I’d even finished the walk. The shoes started to come apart in other areas, though slightly more cosmetic. The shoes have now been resigned to the bin after less than 300 miles. I know there are many converts out there who swear by Trail Shoes and push the boundary of when and where they use them, and would never look back now they’ve seen the light. But I guess we all have different styles of backpacking and very different feet, and for me it’s a leap too far from that Trail Shoe birth place in North America to the wet boggy conditions of typical UK upland backpacking. For overnight trips, or extended backpacking where I plan to have odd nights in hostels or B&B’s then I may still use them. But for longer trips of wild camping where ground conditions could be wet and boggy for prolonged periods I’ll be switching back to a more traditional boot. A good well fitting boot may well be an investment and take some breaking in, but if Trail Shoes only typically last a season and have limits to their use, they also start to look expensive by comparison. ** Trail Shoes with open mesh toe boxes also provide limited protection from simple hazards such as thistles. I noticed a couple of times when walking through thistles that the tiny thorns got through the mesh and pressed into the skin of my toes…..a perfect route for infection. I must admit to being a trail shoe convert. But you are correct on 2 huge counts. and no 2 pairs of feet are the same. I have been using Gortex lined ones and these work ok for me, BUT once they get wetted out, they are a bu***** to dry. One day I may find a pair of boots I like enough, but I’m still waiting for them. Thanks, I’ll be checking Altbergs out myself. I used Salomon X Ultra mids on last years TGO, and I must admit I’d rather have damp feet than sopping wet feet. They were great. That membrane probably also filters out at least some of the crud that seeps into your boots/shoes. A sobering lesson. I’m with you on boots vs trail shoes. Trail shoes are great for dry weather but constant wet and cold, no thank you. Much prefer some lightweight mid boots, which are also more supportive on uneven ground, especially on descents. I’ve also become appreciative of lined boots. While they won’t keep your feet absolutely dry, they do prevent your feet from being “flooded”. I know you’ve had an issue with the v2 X Ultras, but you might want to persist. Mine seem to be fine. Worth looking at Ecco Bioms as well (they’ve changed the models recently, so I can’t give you a model). Yak leather dries really quickly too. I get bruised toes and have found Superdrug gel toe protectors really effective. I tracked down the problem with the X Ultra 2, and forgot to add that mine are the mid version…and that’s probably why you’ve not noticed a change. The inner lining on the mid changes for the upper part of the ankle collar, and in the version 2 the upper part of the collar uses a significantly coarser weave fabric than my original ones. So it tends to grip the sock a bit more and hense causes a bit of friction. It’s a very subtle change, but enough to cause a blister. I’ve buffed the fabric now and rubbed in a bit of candle wax. I was thinking of the Mids too (although I do have shoes as well). I wear two pairs of socks (Smartwool outers) so maybe that’s why I haven’t encountered the same problem. Thank goodness you stopped when you did! Very interesting post – and I hope the infection clears up quickly without any lasting effects. I’m sure it will, looking better already. I’m a convert to trail shoes too after many years of using boots. My trail shoes are always the waterproof type. I did flirt with the non-membrane ones but found them impossible to dry out. Mind you, if the waterproof ones do wet out they take ages to dry. I’ve found the most likely cause of water ingress is via the ankles as wet socks wick the water in. I’ve got a pair of ankle gaiters which stop that happening. Since using them I’ve never had wet feet (touch wood). A trick I was told about and that actually works is at the end of the day’s walking, dry the feet thoroughly and then out on a pair of waterproof socks. The heat from the feet help dry the shoes out. When you get into the sleeping bag change the waterproof socks for normal sleep ones or sleep bare-footed as you please. I assume that would work for non-membrane shoes too. The other thing I’ve found crucial is to a have a good footbed with a firm ankle cup as it stops the feet from sliding about. I’m glad that the antibiotics are working- your pic of your feet looks bloody painful. I’ve used Salomon X Ultra for the last couple of years, usually with either an ankle gaiter or longer (I used a debris type ankle gaiter with the Vapour Claw on tne Cambrian Way). The Salomon have been great, getting a bit damp on occassion but never sopping wet (probably as much from sweat as water ingress). It was my Salomon that split across the toe box a week or so before the Cambrian Way, and after a replacement pair caused a bit of rubbing on the heel I switched to the Berghaus shoes at the last mjnute for this trek. I may well continue using a mid style trail boot with a membrane, but my experience with a non-membrane trail shoe this time was not good. And for the winter months I’ll continue with a leather boot. I use the Salomon too. Can’t remember the model name. I bought them to replace some Berghaus ones which were an absolute disaster – quickly started to wear out, membrane died after a couple of months. I don’t know if it’s just me but everything I’ve bought made by Berghaus in the last five years or so has been very poor. By contrast, my goretex Berghaus mountain jacket ( the long length) is still going strong after twenty years. Boots: I loved my Brasher Hillmasters so when they wore out I got a new pair and they were horrible. Leaked, rubbed blister in minutes flat, etc. That’s when I made the switch to trail shoes. It’s whatever suits the individual at the end of the day; I’d only use boots now in winter but, after your experience, I can see why you prefer boots. I’ve no idea why the extra “The other thing” appears at the end of my post! I’ve done all of our Big Walks since 2010 in mesh trail runners, but I’m not sure I would have done so without the assistance of GoreTex oversocks (I have one pair of Rocky and one pair of Gore Bike Wear, but sadly neither are made any more). The extra layer is not so comfortable as to be unnoticeable, but I like the flexibility of being able to keep the feet dry (or, these days, dry-ish; both pairs are getting on in age now and aren’t as waterproof as they once were) when there’s lots of wet stuff underfoot, but being able to go membraneless and let the feet breathe when it’s dry. Sadly, it won’t be too long now before both pairs cease to be serviceable and I’m not sure what I’ll do then. Anyway, glad your feet are on the mend. I guess I’ve always been worried that waterproof socks would make my feet hot as I tend to run hot anyway, but from the number of poeple that use them I may have worried unecessarily. They’re certinly worth considering. There seem to be two types, the Goretex type with a membrane, and ones with an actual rubber barrier bonded between two layers of fabric. Eeew! You were wise to stop before your toes all shrivelled up and fell off. I’m a Trail Shoe convert … but mainly because I just can’t find boots that fit well. I have various pairs of boots that I wear in winter – but there must be something about the way I walk that means I always get wet feet, even with boots on. The fear (and previous experience) of painfully wet feet led me to start this year’s TGO Challenge with three pairs of normal walking socks, a pair of Sealskinz and a pair of Neoprene socks – as well as a tube of Gehwol footcream and some soft comfy socks to wear in the tent. However, the fine weather meant that my feet were never more than pleasantly damp apart from one afternoon when I got lost in a bog …… but I could dry off completely in the evening and start again with dry socks in the morning. I hope your feet are soon well again. Thanks for sharing the story/warning. If I ever dare to try open mesh trail shoes for an extended trek again, I may well carry a pair of sealskinz to give me feet a break in wet ground. Sounds like a great idea rather than wearing them every day. But I’ll admit that I’m still a boot person at heart so I may just stick with what I know and hope to find that Holy Grail of a boot that fits…..and pray they don’t discontinue the design when I need a replacement pair. Boots – shoes, the debate will go on and on. Not long ago i bought a pair of Ecco Biom Terrains after lots of bloggers wrote how good they were and i walked in them for about 50 miles without a blip of trouble. Then in Scotland a few weeks ago i had walked about 5 hours when my left foot started getting sore. It got so bad i could hardly put one foot in front of the other. When i changed into trail shoes the problem disappeared. As soon as i put the boot back on the soreness came back. I havn’t a clue what the problem is and my right foot is fine. I have another lovely pair of Ecco La Paz boots (Sadly discontinued) and when i wear these i have no trouble at all. The trouble is i am a dry foot person so trail shoes are for fine weather only. That should read Ecco Expedition lite La Paz high boot. (Just for the record). Call me old-fashioned if you like, but I’ve never been convinced by the so-called benefits of trail shoes. For me it’s proper walking boots with ankle support every time. Many an occasion I’ve hiked through rough terrain and up and down some pretty steep, rocky hills, and I just couldn’t imagine trail shoes coping. And your post merely reinforces my thoughts. As an update, my feet haven’t fully recovered from the backpack in June, three of the five toe nails I lost have refused to grow back at all. I will only be using trail shoes for dry over night hikes in the future, but not for longer trips where ground conditions could be wet for prolonged periods. Hhmmm… what’s the doc saying about that? I once lost a (big) toenail but it grew back in pretty quickly. I had a bad foot infection earlier this year that required a double dose of Flucloxacillin for 10 days to sort out. Very painful. I run a fair bit and it was caused by some persistent athlete’s foot between my little toe and the one next door that I had ignored for a while. I also fell run and it’s possible the infection came from bog/mud/still water that you end up tramping through. I’m now much more careful about drying my feet day-to-day and when backpacking. I’ll still use running shoes for long distance backpacks – I find boots too heavy/uncomfy/sweaty/blistery and, whilst if you stick to paths/tracks you can keep your feet dry in boots, I tend to go ‘offroad’ quite a bit and find it’s impossible to keep your feet dry (at least in Scotland/Ireland where I do most of my walking). The exception is winter when it’s just far too cold for shoes. Tent routine involves washing feeet, drying with paper tissues, airing then athlete’s foot powder if required plus clean/dry socks for the evening. Bit of a palaver but worth it. I must admit I’ve rather been put off using trail shoes again for long distance walks where the weather could throw anything at me, for any length of time. I’ve switched back to something with just a little more protection, Salomon Ultra GTX Mid. They were actually what I’d been using for the previous few years without incident, so an easy decision to switch back. To be honest they are little more than a trail shoe really, but I guess I’m one of the few that actually likes a membrane liner to keep the worst of the wet out. I did the TGO Challenge again this year in them and my feet never got wet once. Superbly comfortable for 230 miles over the mountains. As you say though, a good evening routine goes a long way to making your feet feel good after a long days walk. I think in the case of the Cambrian Way it was simply the combined impact of feet being sopping wet day after day without let up. A couple of dry sunny days and it may all have been very different. But that’s UK weather for you.